If you’d like your home to stand out from the rest of the neighborhood, consider customizing your front door. It may seem like a small detail but custom doors are able to change a home’s entire facade. Since the front door is the first thing you see when you come home, doesn’t it make sense to make it as beautiful as possible? Friends and family will also use this front door to enter your home. Your home’s front door is your first impression. With a custom door, you can feel confident in knowing that your home’s first impression will articulate your style. Trim Team is ready to help. In order to build a home, builders must begin with a stable foundation. The same can be said for custom doors. The foundation, in this case, is the door itself. Therma-Tru Doors, the preferred exterior door vendor for Trim Team, offers a wide array of options. On top of being beautiful, Therma-Tru doors provide durability. Fiberglass doors are also a popular option. Although they look like wood, they won’t warp or rot like wood. Instead, they’ll retain their original shape and look great for years to come. Fiberglass doors don’t require much maintenance at all so you can feel confident in knowing that the door you choose will look beautiful and resilient. 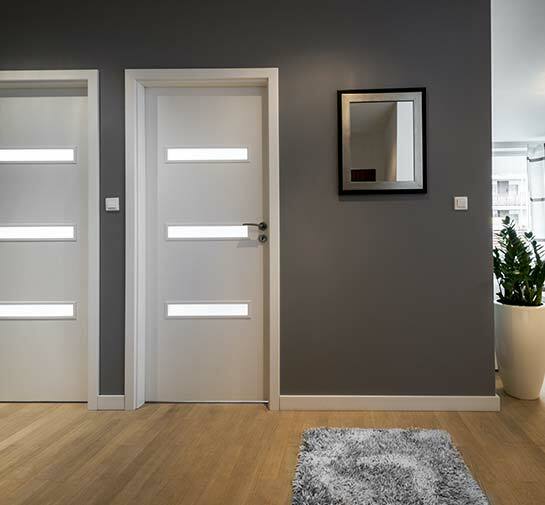 Best of all, fiberglass doors can be designed to suit your own personal aesthetic. If you’re looking for a one-of-a-kind entry door, Trim Team can help. Now that you’ve decided on the door, it’s time to move on to other customization options. Perhaps you’d like a solid front door with a beautiful, intricate design. Or perhaps you’d like do add some glass to the entry door. Windows can add a breath of fresh air to your home’s interior while providing a clean, welcoming aura to the front door itself. Trim Team’s preferred decorative glass vendors are ODL and RSL. Both brands offer beautiful decorative glass that will bring your custom door dreams to life. ODL offers layered glass and textured door glass while RSL’s decorative door glass focuses more on design and originality. No matter what you’re after, our preferred vendors will have exactly what you’re looking for. Trim Team is ready to help homeowners in El Paso who are looking to differentiate their homes. We offer custom design entry doors in several wood options as well as fiberglass and steel. With our help, you can open the door to a brighter future!